This is the oldest and simplest technique used to put more than one processes in the main memory. In this partitioning, number of partitions (non-overlapping) in RAM are fixed but size of each partition may or may not be same. As it is contiguous allocation, hence no spanning is allowed. Here partition are made before execution or during system configure. As illustrated in above figure, first process is only consuming 1MB out of 4MB in the main memory. Hence, Internal Fragmentation in first block is (4-1) = 3MB. 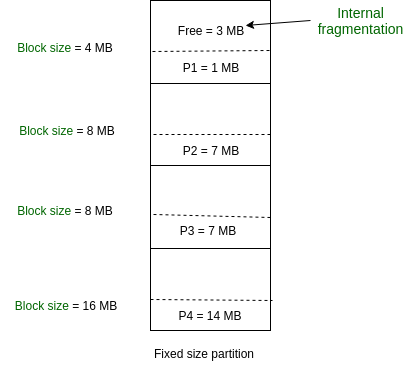 Sum of Internal Fragmentation in every block = (4-1)+(8-7)+(8-7)+(16-14)= 3+1+1+2 = 7MB. Suppose process P5 of size 7MB comes. But this process cannot be accommodated inspite of available free space because of contiguous allocation (as spanning is not allowed). Hence, 7MB becomes part of External Fragmentation. There are some advantages and disadvantages of fixed partitioning. Algorithms needed to implement Fixed Partitioning are easy to implement. It simply requires putting a process into certain partition without focussing on the emergence of Internal and External Fragmentation. Processing of Fixed Partitioning require lesser excess and indirect computational power. Main memory use is inefficient. Any program, no matter how small, occupies an entire partition. This can cause internal fragmentation. The total unused space (as stated above) of various partitions cannot be used to load the processes even though there is space available but not in the contiguous form (as spanning is not allowed). Process of size greater than size of partition in Main Memory cannot be accommodated. Partition size cannot be varied according to the size of incoming process’s size. Hence, process size of 32MB in above stated example is invalid. Partition in Main Memory are made before execution or during system configure. Main Memory is divided into fixed number of partition. Suppose if there are partitions in RAM and are the number of processes, then condition must be fulfilled. Number of processes greater than number of partitions in RAM is invalid in Fixed Partitioning.